You probably already know how to back up photos to your computer. Now, we’ve got a major task at hand – how to transfer photos from computer to iPhone to show our friends or post on Instagram? You can always try the traditional yet not so classy method via iTunes but bear in mind that it’s not the only solution – there are other ways to transfer photos from your computer to iPhone. The first app that comes to mind when you think about transferring photos to iPhone is, of course, iTunes. However, during my tests, I’ve discovered that iTunes removes the existing Photo Library from the device and substitutes it permanently with the folder you are transferring to iPhone. Just adding a couple of new photos to iPhone is not possible via iTunes – you have to overwrite the existing Photo Library. This makes it quite problematic to manage photos. Luckily, I’ve managed to discover and compare 5 working alternatives. Enjoy! 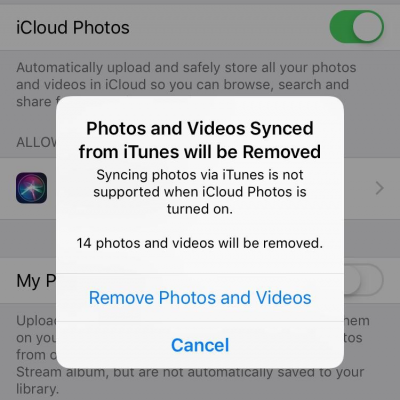 If you are using iCloud Photos (former iCloud Photo Library), your photos will be automatically backed up to Apple’s cloud service – iCloud. Since the sync happens automatically in the background, the question still remains: how to upload photos to iCloud from PC? For that, you’ll need iCloud.com! You log in, select the Photos section in the main menu and immediately see your iCloud Photo Library on your computer screen. To put photos on iCloud, click on the “Upload photos” button at the top-right corner and select the photos you want to import. The photos should immediately appear on your iPhone and any other device having the same iCloud account signed in. 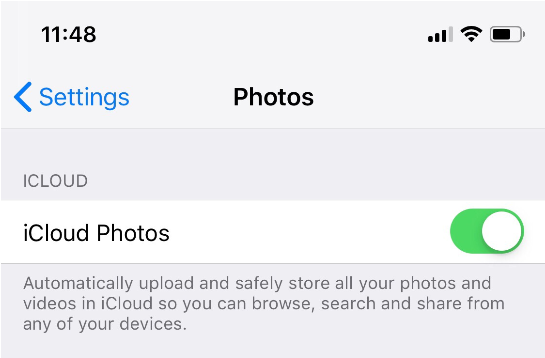 If that does not happen, check if the iCloud Photo Library is enabled on your iPhone or iPad: Settings> Your Name> iCloud> Photos> iCloud Photos. Everything that you store on the iCloud is stored on the Apple servers as well. If you want to delete some images forever, they will be deleted from your account but not from the Apple servers. We even conducted an investigation and created a tool that can recover deleted photos from iCloud. On icloud.com, the uploaded images can be manually sorted by album. But within an album, the photos are sorted by the transfer date and you cannot change this order online. Another major drawback is that if you disable the iCloud Photo Library and turn it back on after some time, any picture you previously added to iPhone with iTunes (or any other third-party app like CopyTrans Photo) will be deleted. That’s why you should be extra careful with this setting and regularly backup your cloud photos to a computer. 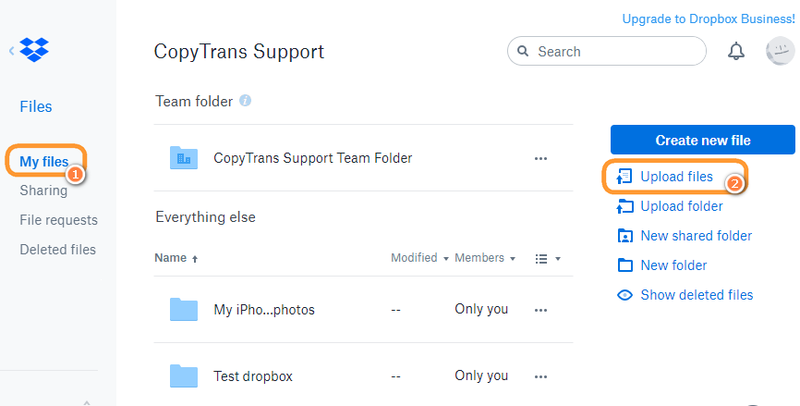 If you are wondering how to transfer photos from computer to iPhone without uploading your personal data to Cloud, you should try CopyTrans Photo. 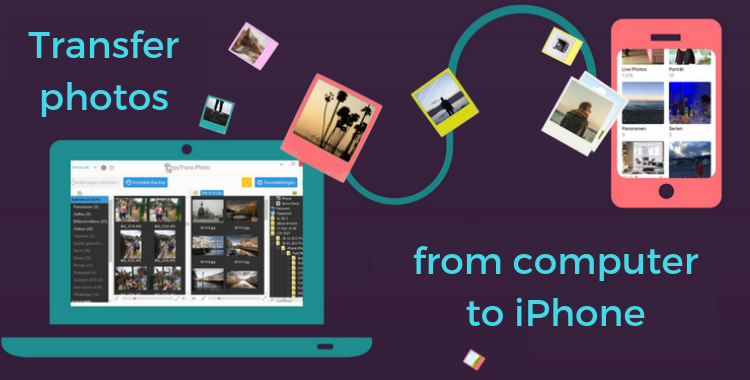 It’s simple and intuitive – just drag and drop files from the right side to the left to add photos to iPhone. The PC photos are saved in the native Photos app on iPhone. Also, the EXIF data (date created, location, etc) is stored and the order is taken into account. You can also transfer videos from PC to iPhone if they are not larger than 1Gb. They will also appear in the native Photos app after transfer. CopyTrans Photo is not a cloud solution and can be used without iCloud Photos enabled. CopyTrans Photo doesn’t require an internet connection. Another key benefit for iPhone 7, iPhone X and iPhone Xs users: the program supports HEIC photos. It can view and transfer HEIC photos, and even convert HEIC to JPG. Disadvantages: After the free trial version with 100 actions, you will be asked to purchase a full version for $19.99. The purchase grants you an access to free updates for 2 years after your purchase along with a free 24/7 dedicated email support. If you have a Google account, you are automatically eligible for 15Gb of free storage on Google Drive (originally SkyDrive). However, Google Drive shares this storage space with other apps, like Gmail and Google Photos. In order to use this option, you will need to download the official Google Drive app on your computer and your iOS device. 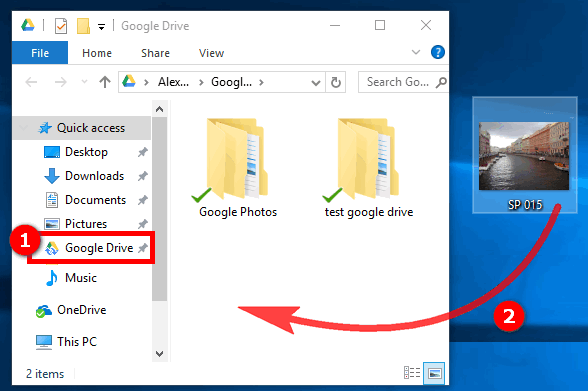 Once you run Google Drive on your PC, create a new folder and copy photos to iPhone. The folder will appear with the photos on iPhone in the Google Drive app. You can create additional folders to transfer multiple photos to iPhone and move them between folders. There is also a possibility to sort photos within one folder by date or by name. The uploaded photos will not be saved in the native Photos app on iPhone but in the Google Drive app. 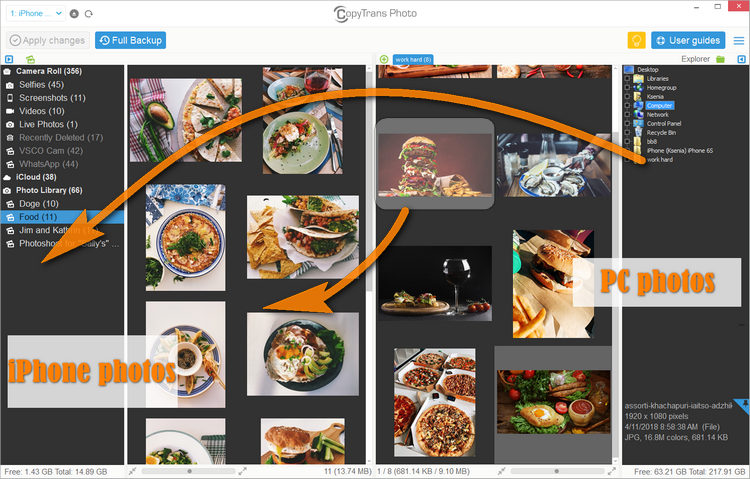 You cannot edit the photos within the app without first copying them into the native folder – double work. Dropbox offers only 2GB of free storage to their users, but on the other hand, you do not have to install the program on the PC. 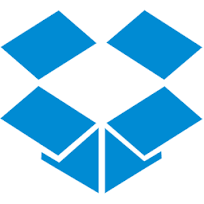 In order to transfer photos from a computer to iPhone, save your data online on dropbox.com directly: log in, create a folder and upload the photos from the computer. After that, go to the Dropbox app on your iPhone to see your imported pictures. Unfortunately, you can only upload individual photos, since Dropbox does not allow importing a folder. Although HEIC photos are imported, they are not recognized natively. With Microsoft’s OneDrive you get 5Gb of storage space for free. Just like Google Drive, it requires you to install the official OneDrive app on both your computer and iDevice to transfer photos to iPhone. 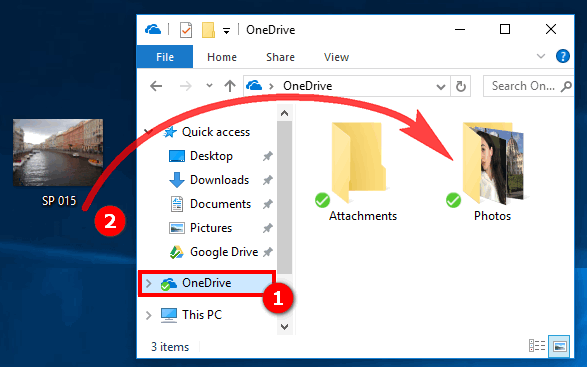 Drag the desired files or entire albums to the program window and after a few seconds, the images will be seen on the iPhone in the OneDrive app. The photos are transferred in the original quality including the date created. The library can also be sorted automatically by tags. The photos are not transferred to the pre-installed Photos app, but to the OneDrive app, which should be installed on the iPhone beforehand. 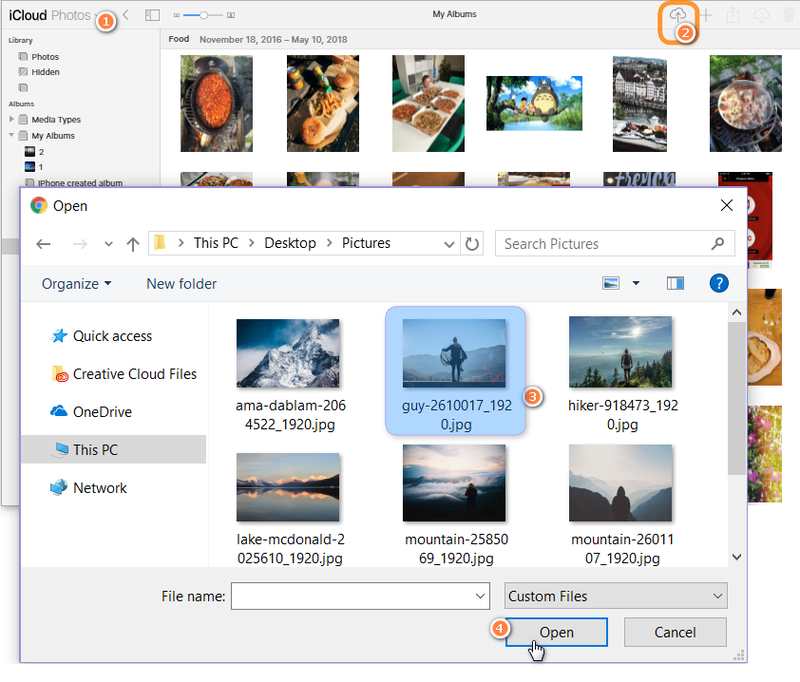 OneDrive app does not provide built-in image editing, nor support for HEIC photos: the latter cannot be displayed in the OneDrive app and also cannot be copied to the Photos app. If you don’t trust cloud solutions, find iTunes hard to use and want to keep your photos in the native Photo app, CopyTrans Photo is the best solution for you. 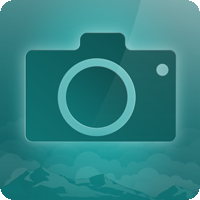 The program allows managing iPhone photos and videos on PC and has several unbeatable advantages such as managing Live Photos, viewing pictures in HEIC format, keeping excellent quality, order and EXIF files, and much more. Give it a go today! How to transfer HEIC photos to PC?